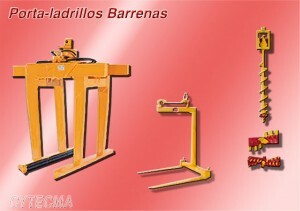 – Palet carrying with fixed nails or forks for the lifting of loads, idela to transport all the good on pallets throug a crane. Made of very resistant steel. – Hydraulic palet carrying are hydraulic clamps that manipulate the load from sides, transporting it to the desired place. – Drilling augers, for making holes in different surfaces, with diameters ranging between 200 mm and 750 mm, and with spiral length from 1420 mm to 2200 mm. With tips for soft and hard surfaces. We have several models according to the needs.